I've been living with pre-diabetes and diabetes (the pre- turned into the full thing post-cancer treatments, unfortunately) for about 3 years now. That has meant having to adjust many things with my eating and cooking habits. One of those things is canning and preserving all the wonderful things that are in season in the spring to summer. I used to make jars and jars of strawberry jam and apricot preserves, as well as dark plum jam and cherry jam. I loved to see the jewel toned jars lined up in my pantry. We gave away most of those jars, but I loved to eat them too. I still make a few jars of jam, but since I have cut out most sugary things from my diet except for very occasional treats, and The Guy is nice enough not flaunt The Sugar around me, jam consumption in our house is way down. The same goes for other preserves too. Preserving foods the old fashioned ways using methods like making them into jams or pickles, often involves adding lots of sugar, salt and vinegar. Vinegar is not bad for you (that we know of right now anyway!) but sugar and salt intake have to be watched by a lot of people. For instance, my mother loves making umeboshi every year, but she has to give away most of it since she has high blood pressure. I try to avoid high-salt preserves and pickles too (although I do make a few jars of chutney when black plums are in season) since The Guy has high blood pressure. A lot of standard pickle recipes use a lot of salt and sugar besides the vinegar. Still, I do like to preserve some summery goodness for the dull days of winter. We don't have a vegetable garden at our current house yet (the garden is still a pile of weeds and rubble) but the local produce in Provence is so cheap and wonderful in the summer, it's a shame not to try to keep some of it. Here are a few ideas for healthier preserving. 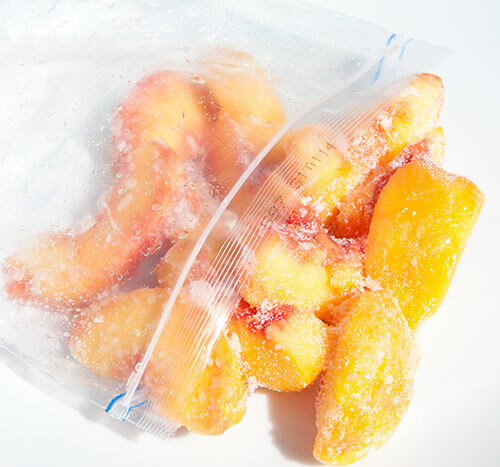 This may be obvious, but a freezer is your best friend if you want to keep produce for use later. Our ancestors didn't have freezers, but hey - we do! If you can afford it budget and space wise, a dedicated freezer is one of the best investments you can make, especially if you have a vegetable garden and/or fruit trees and plants, and you want to eat a reasonably healthy diet. It doesn't have to be the huge coffin like type that resides in many garages and basements (we used to have one of those at our house in Switzerland, but I never liked using it much since things always got lost in the bottom). I have a small freezer with drawers (this one actually; the refrigerator unit was broken by the movers, grr) that is very energy efficient, and takes no more space than a low chest of drawers. It's in a storage room rather than the kitchen (we have a regular refrigerator in there with a pretty big freezer compartment); despite its compact size it can hold quite a lot of bags of frozen cut up fruit and such. Right now we are in the middle of peach season, so I'm trying to bag up as much of it as possible - although it's so good, it's hard to resist eating it all up as it comes in! Do be aware that many vegetables need to be blanched (cooked quickly in boiling water, then cooled down in cold water) before freezing. Many fruit and vegetables will get mushy in texture when frozen, since the ice crystals break down the fibers. That's not an issue if you are freezing fruit to use in smoothies and so on. Just expect to use frozen veggies in soups and stews rather than in stir fries. Chopping up some types of vegetables and herbs works very well. For instance, try the basic basil puree at the end of this page, which is just chopped up basil, olive oil and an optional bit of salt. Parsley can just be chopped up and frozen in plastic containers or bags; just take a little at a time as needed. Chop up chives, nira (Garlic or Chinese chives) and such with a knife, freeze loose in containers or bags, and use as soup garnishes or add to stir fries and so on. Also, don't freeze more than you will be using up in a few months - in other words, what you'd use up during the winter. Frozen foods don't have an indefinite lifespan. Drying fruit and vegetables is very interesting. Various dried vegetables are used in Japanese cooking, such as kiriboshi daikon (shredded dried daikon radish). In Switzerland, dried green beans are popular - they're just stewed or put into soups and stews. Besides green beans I've experimented with drying slized zucchini, tomatoes, and even garlic cloves. To dry produce you do need a food dehydrator, although you can try using the oven (Pim's tomato confit using oven dried tomatoes is quite awesome). I have a really ancient aluminium dehydrator inherited from my mother in law, but one like this model is much more modern and energy efficient I'm sure. You can try out things like fruit leathers and beef jerky in those things too. You can still make preserves in good old jars, if the recipes do not use a lot of sugar and salt. I plan to make another batch of this tomato sauce for example, and I may also make a modified version of this red pepper jam with reduced sugar since it doesn't rely on sugar for its consistency as many jam recipes do. Fermenting foods is another way of preserving them. Sauerkraut is a classic fermented-preserved item, and many long-term storage Japanese pickles are fermented. I haven't gotten into this much yet, but I am doing some experiments along this line with some interesting things... and no I don't mean brewing. ^_^; One thing I'm trying out is fermenting tomatoes. I'll report back on this soon! Submitted by maki on 2013-08-07 11:35. I’m following a very low Carb (Atkins) diet, due to pre-diabetes, and would really love to see some more carb-free recipes! Cooking Japanese without sugar, starch and/or rice seems to be hard. Although I’m quite happy with what I eat, some inspiration is more than welcome! The freezer is stocked with frozen vegetables, now a days, because I can only eat limited quantities of them, and this way I can keep my diet rich in variety. I second the carb-free or very low carb recipe request! Low sodium recipes would be great too! US. It's "sugar free" pectin for jellies and jams. helpers or not. But I will look next time I'm out. DiabeticSweet, you can find it on Amazon. I have been a type two diabetic for about ten years and really appreciate any low carb recipes you post. I lived in Japan for eight years while I was in the military and have had a Japanese wife for fifty years now. I love rice and noodles but sadly have had to relegate them to the foods that I can only eat in small quantities. Your discussion of drying brought back memories of childhood. My mother dried things the old fashioned way, by using the sun. Every summer she would peel and slice several bushels of apples and peaches and I would climb up on the roof and spread the pieces on a clean white sheet. Had to check them occasionally to make sure the ants hadn't found them, if that happened we simply switched them to another roof. There was no sulfuring so the fruit would turn brown but the pies that were made in the winter were the best I ever ate. The fruit flavor was concentrated in the drying process. I've been using this preserving book for years--not because I'm a diabetic but because I don't like sweet jams, etc. She uses concentrated apple juice and grape juice and a natural sweetener and gives equivalents for diabetics. I use the Pomona pectin method only when pressed for time because I don't really like the texture of the resulting jell. Are the green beans in Switzerland you referred to dehydrated whole? Do you realize that apple and grape juice have the highest sugar contents of common fruit juices? They are used as a combination sugar substitute and filler in many mixed fruit drinks because of that. Preserving with fruit juice instead of cane sugar isn't going to help diabetics all that much unless they benefit from a switch to fructose sugars more than I think they do. [quote=anon. ]Do you realize that apple and grape juice have the highest sugar contents of common fruit juices? They are used as a combination sugar substitute and filler in many mixed fruit drinks because of that. To be honest, it's a misconception that diabetics cannot have cane sugar or fruit juice. I have them all the time, and I still have all my fingers, toes, and my blood sugars are in range. The key to eating food as a diabetic is to remember that you need to account for what you eat. If you are not taking medication for diabetes, then you need to find a way to work off the glucose rise. It could be by exercise, reducing how much you eat, or a combination of both. I agree that sugar is sugar in all forms. Be it fruit juice, or cane sugar, in the end it's the same. The point is that you need to moderate the amount that you are eating, and you will still be able to enjoy your life. I get to have the delicious preserves, and only have to replace something else in my meal, such as a starch in it's place. I've only commented once before, but I love your site and make many of your recipes regularly! I just wanted to share a really simple recipe for fermented carrots - it's the first ferment I made and still a favorite. Rather than whey, I use a 2% brine - 19g salt to 4 cups water. There is a great method for extracting pectin from Granny Smith apples (peels and seeds/core are essential, plus a lemon) that yields a natural pectin base that is NOT sweet and, if you aren't too obsessive about straining it, also full of fiber and vitamins. I haven't done a nutritional analysis of it for diabetic diet purposes, but it sure isn't sweet, and does make a nice "natural" gel (not a space-age rubber texture). Even if you add a bit of sweetener to take the green apple edge off you still taste fruit first and foremost. Wonder if this would work for diabetics as well? I've been making Kimchi a lot lately, and plan to try making Sauerkraut this fall. I've found Kimchi to be far less complicated to make than I originally thought, especially once you got some going, because you can use some of the old juice to infuse the next batch with, which speeds up the process a lot. Lactobacillae seem to have almost gone extinct in european kitchens and even professional bakeries, but they're so useful! I also made sour dough from scratch some time ago and have been using it since to make old fashioned german rye-bread. I'm really looking forward to the outcome of your tomato-experiments. Also, have you ever tried making miso yourself? The North American debut of "What Did You Eat Yesterday?" is scheduled for March of next year.